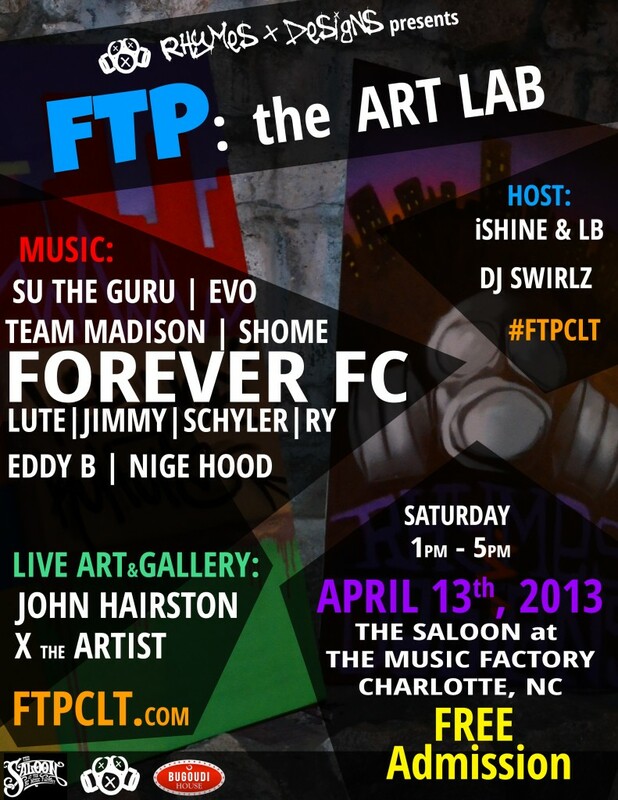 Saturday, the 13th of April, Rhymes & Designs will be hosting a one-of-a-kind art event in Charlotte: FTP: the ART LAB. What’s FTP? For The People, Follow The Passion, Fight The Power … people do what they do for different reasons, what’s your FTP? FTP will include live music and live art, anything could go down in the art lab. Performances by SU the Guru, Evo, Team Madison, Shome, Eddy B, Nige Hood, and Forever FC. Art show by John Hairston and X the Artist. We’ve also got Shome, Team Madison, SU the Guru, and Evo blessing the art lab stage as well. Check out FTPCLT.com and follow along via #FTPCLT. See you April 13th!